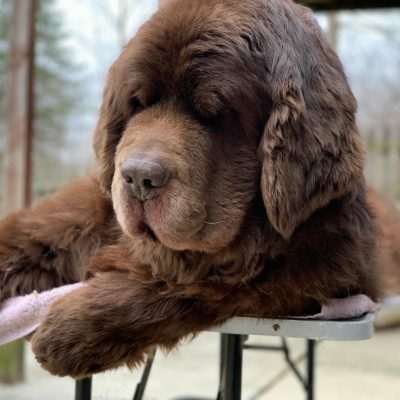 Bloat is a serious condition that can happen to any dog but it is more commonly seen in large or giant breed dogs that have deep chests, such as the Great Dane, Newfoundland, Boxer, Great Pyrenees, Irish Wolfhound, Irish Setter and several other large, deep chested breeds. The condition is usually seen in adult dogs over the age of 4, and some studies have suggested that male dogs are more at risk than female dogs of getting bloat. Bloat is the combination of 2 conditions-gastric dilatation where the stomach fills with gas and fluid, and volvus, which is where the gas filled stomach twists (GDV). Once the stomach twists, the blood supply to the stomach is cut off and the stomach begins to die which can lead to shock and death of the dog. A dog can bloat and not have the stomach twist, but it is still a very serious condition because when the stomach fills up with gas and fluid it puts pressure on the surrounding organs and the diaphragm which makes it hard for the dog to breathe and can cause serious damage to the stomach and the surrounding organs. Unproductive vomiting-which means the dog is trying to vomit but only foam or nothing at all is coming up. It’s pretty scary and it happiness very fast. So fast that your dog can be fine and then the next minute you notice his stomach is distended, he’s trying to vomit and you grab your keys and head to the emergency clinic and on the way there he dies. In my research it seems that no one knows for sure but studies have suggested that dogs who eat one large meal a day, have anxiety, exercise vigorously before and after eating and drink large amounts of water before and after eating are more prone to bloat. Some recent studies have sugguested that dogs who suffer from IBD are at an increased risk for bloat. How can you try to prevent canine bloat? That’s a great question and one that doesn’t seem to have a straight answer. There seems to be several studies that contradict each other and I’m not a vet so the best advice I can give is to talk to your vet about bloat and ask them about ways that you can try and prevent it. I feed twice a day, instead of one big meal once a day. I don’t allow the dogs to heavily exercise an hour before and an hour after eating. I don’t let them drink a ton of water an hour before and after eating. Leroy likes to go outside and roll around after he eats and I try to discourage this even though its never been proven to cause a dog to bloat. I know their bodies and I know them. I feed from a semi-elevated feeder. This is one of those things that studies have gone back and forth with over the years. Years ago studies suggested that feeding from an elevated feeder could help prevent bloat but recent studies suggest the opposite. I’ve always fed my Newfoundlands from elevated feeders without issues but that doesn’t mean I’m preventing bloat. Some people will tact (gastroplexy) their dog’s stomach to prevent torsion. Tacking a stomach does not prevent bloat but in most cases it will stop the stomach from twisting. 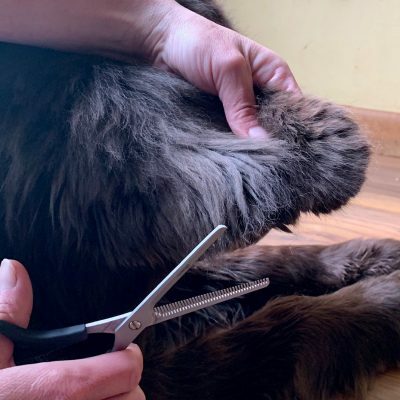 There are also bloat kits that are available but since most pet owners will not feel confortable putting a tube down their dog’s throat, getting your dog to an emergency clinic as soon as possible is the recmommended course of action. Having a bloat chart available in your home is also recommended. So how about you? Do you have a breed that is prone to bloat? Do you know the signs? Any tips you can share? **On a side note I’ve discovered that the link to the official Purdue study is broken which is why there is not a direct link to it. If you suspect that your dog is suffering from bloat it is best to seek treatment at the first signs of distress. Do not wait for symptoms to progress as bloat happens fast. You can use the below area to monitor your dog's vitals. Mom helped her vet friend in Germany with three bloat cases. She said it was so hard to see because the dogs were in such pain. Two of the three did not make it, but since those experiences, she is real careful with us. We eat twice a day, but she also trained us to eat, drink and then take a 1+ hour nap. Most dogs want to run around and play after they eat, but we just nap. There is no 100% way to prevent it from happening but we do what we can. Sure hope Leroy feels better soon. Katie has been sick on and off for the past couple weeks for no know reason. That is so sad. I saw a few cases of bloat come in when I worked at the vet too and the outcomes were always death. It just happens so fast and so many people don’t know what is happening. I’m sorry to hear that Katie isn’t feeling well and I hope that she feels better soon! I had a large Malamute mix for many years, and I was always concerned about bloat with him as well. So glad Leroy is ok! It’s such a huge concern with these big guys and is always in the back of my mind! Thank you for sharing this information…we are so glad that Leroy is just fine. The topic of bloat keeps popping up in my news feed, so clearly it’s something that we all need to be aware of. This is a great post, Jen. Thanks for sharing. I’ve been seeing a lot of it around too and I guess it’s got me on top of my game and it’s heavily on my mind! We sure hope that Leroy is feeling better soon. I hate seeing our baby’s under the weather and hate it even more when we don’t know what’s going on. Gentle Newfie hugs from all of us. Thank you! It’s so hard when these guys aren’t themselves! I wish he could just tell me! That is scary! I’m so glad he didn’t have bloat. If a dog with bloat gets to the vet, how likely is it that the vet can save him? Is it easily treated by a vet? From what I know it all depends on how advanced the bloat is. I don’t think it’s easy to treat but I have heard of dogs that have bloated and recovered, but unfortunately I have also heard of many who didn’t. Fortunately my breed, being smaller, isn’t so prone to bloat. But, it can happen to any dog, so it is very good to know the signs. Have your boys had their stomachs tacked? That seems a popular tactic with Dane owners. I am glad Leroy is improving. But, man, you sure can’t catch a break on the canine health front. It seems to me you have earned at least a full year free from health crisis! Neither one of the boys have their stomachs tacked. I thought of it after Leroy last surgery, I should of had the vet tack his stomach while he was in there! I was so mad for not thinking of it at the time! Yeah, Leroy is having a rough year. I just want him back to normal! 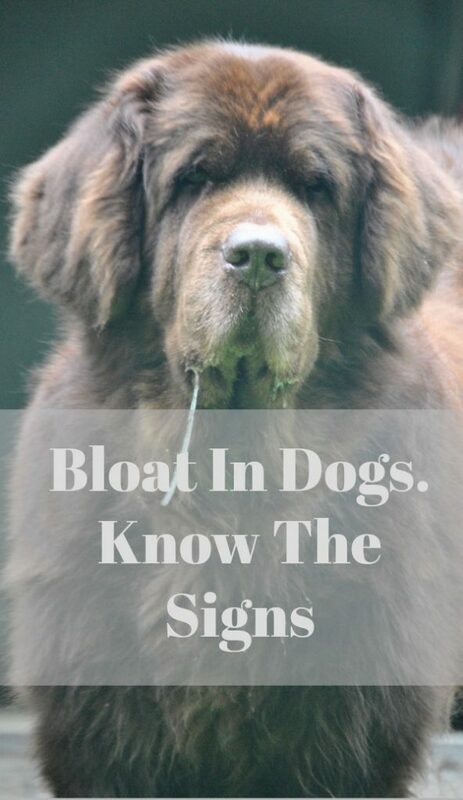 We do many of your tips routinely and I’m very glad to say we’ve never had a dog with bloat. So very glad that wasn’t Leroy’s problem. Hope the vet’s on the right track and Leroy will be feeling a-okay soon! The first time I heard a vet say that a test on my dogs was “unremarkable” I was a little offended until i learned what it meant. So glad Leroy was unremarkable and thanks for your work in researching this. Lol! Over the last year that word is music to my ears especially when we are looking inside Leroy’s stomach! I have read that doxies and bassets can be prone to it too and I’ve read about the Gas-X and I actually bought some at the store today! Thank you for posting this information. 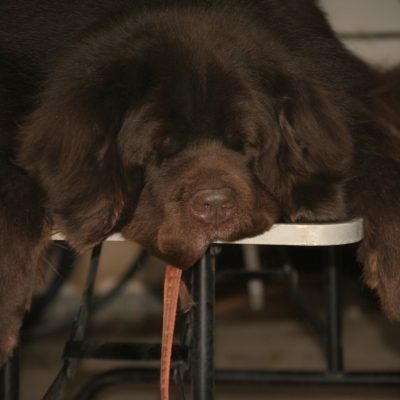 I lost my newfie to bloat and I will never forgive myself for not acting more quickly. We were getting ready for bed and she could not get comfortable – she got up in an armchair, which was not normal. Her belly was like a basketball and her gums were pale (which I checked after going online to look up the symptoms of bloat). Then I called the emergency vet. By the time we got there, she collapsed in the parking lot and we were unable to save her. So, I would say, if you THINK it’s bloat, don’t wait. That was my mistake. I’m so sorry to learn about your Newf. It happens so fast and it is so scary. I have known people who were familiar with it and acting fast and the outcome still wasn’t good. It’s just such a scary condition. Thanks for sharing your story Wendy, hugs to you. Wow am I ever glad you posted this. I have never heard of it, and my dogs always get fed once a day, and of course being Aussies…like to run around like fools at all hours. Will definitely be more aware of these things! Hi Tori! Leroy use to like to run after he ate too! It use to drive me crazy and finally I broke him of it, now he tried to roll all over the ground! I’ve heard that the condition has been seen in doxies, but not as much as the larger breeds. Regardless, I think it’s good for anyone who has a dog to know a bit about it! Sadly, collies are now beginning to see this issue more often. Oh No. I didn’t know that about the Collies. This is one of the scariest conditions I can imagine happening, and I think that German Shepherds are at risk for this, too! One thing I’ve learned is that, if you have any concern that your dog might be bloating, go to the vet … do not dally. It happens so fast and you can lose them in a heartbeat. I’m so glad Leroy’s getting back to normal. I have heard that GSD”s are prone to this too. Exactly! If you suspect bloat…run…don’t walk to the nearest vet! Such good information. Thanks so much for sharing! Oy! Bloat scares are never fun! As you know, Moses bloated once a long time ago. He made it out okay, but it caused me to dig to the deepest pits of the internet looking for info on causes and prevention. Coming up with literally nothing concrete – and a few loose theories – was nothing short of frustrating. Now, if I notice excessive drooling, discomfort, or dry-heaving, I’m quick to observe him closely and feel his stomach for expansion. Like Leroy, he’s also stitched up, but I still worry they could pull out. I do remember about reading about Moses and bloat and I’m so glad he was okay. It’s frustrating searching for causes and prevention because just like you said, nothing is concrete! Leroy’s not tacked. I should of done if last month when the vet was in there but in all the commotion I never thought of it, until after the fact! I was so mad at myself! So glad Leroy is okay! The only thing I’ve had similar was the night before we had to take my Airedale Dannyboy’s suffering away. His bloating was from some tumors rupturing and bleeding into his abdominal cavity though. Most of the same signs of bloat without the vomiting and had a normal bowel movement. Having large breeds with deep chests though, our vet has gone over the symptoms of bloat with us–more than once–and we’ve got a handy-dandy little card of symptoms to go over in case it ever happens, so that I don’t panic unnecessarily. I also go overboard and split their meals up into three. We’re not sure it’s true, but we’ve also been told that grains and sweet potatoes can cause gasses to build up in a dog too, so we mostly stay away from those as well. Yes, sometimes I’ll give them an occasional treat that contains them, but not often. I’ve also got a complete fear of grain allergies, but that’s a totally different story. Oh….I am so sorry to read about your loss. My condolences to you. It’s so good to hear that your vet has gone over bloat with you. I wish all vets would do this with owners who have breeds that are prone to it. Well you know that this post hits home with me. I am very glad that Leroy did not bloat. Thunder only had a couple of the signs when he bloated (with torsion). He did not drool at all and his abdomen was soft. But he did have some pain. It was the unproductive vomiting that told us to get him to a vet ASAP. He was trying to vomit and nothing was coming up and he was standing roach back. A couple weeks ago I took Storm to the vet because she was drooling excessively. Nothing else….just A Lot of drool for a few hours. I talked to her breeder and as drooling is an early sign of bloat, we (hubby, breeder and I) all decided to take her into the vet for an x-ray. It was unremarkable too. Still don’t know what it was, but there was no signs of boat. I know you are very experienced in this area. I didn’t know that Thunder’s stomach wasn’t distended, geesh…that is scary. I kept watching for Leroy to arch his back and he didn’t, but he was very hesitant to move. He would take a step and then just stand there and stare, it was weird and scary. I’m so glad that Storm was ok, I wonder what it was that had him drooling….and you are right, better safe than sorry! First I’m so glad that Leroy is on the mend and it wasn’t bloat! I know of a number of people who lost their dogs to bloat. 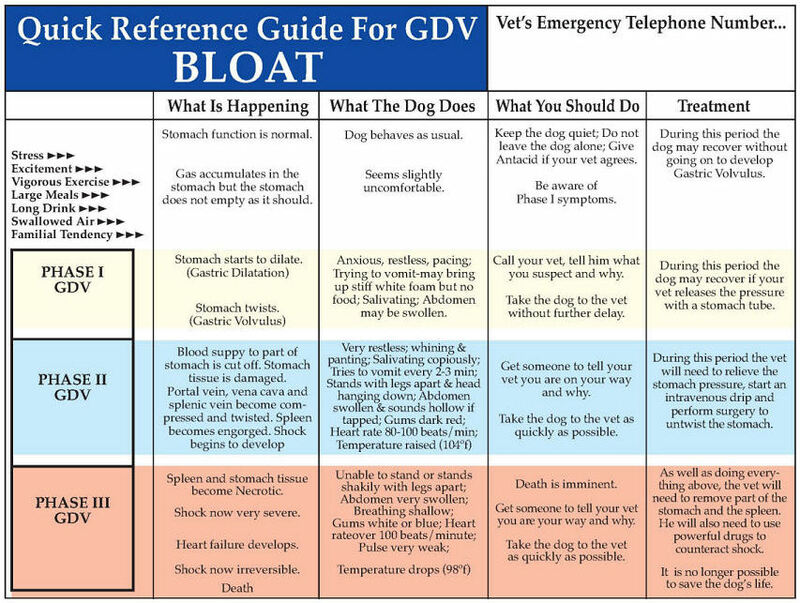 Since my dogs are on the bigger side I’ve familiarized myself with bloat and I have printed off the symptoms and have it tucked in the records books just for reference. I feed twice a day on a twelve hour increment. We do not exercise one hour before eating or two hours after and I will yell at them if they try and run in the house. Sampson is typically not a big drinker but Delilah loves to fill up at the water bowl and I will tell her “enough” if she’s been there too long. I won’t lie to you, this sh*t scares me to death and I would err on the side of caution and rush to the vet if I even suspected it! Thanks for such a great post, it’s so important for us to get the word out. The people I know that lost their dogs to this had no idea about bloat. There a lot of people who don’t know about bloat. My uncle lost his Irish Wolfhound to bloat a few years and he had never heard of bloat. Leroy drinks a ton of water too and I’ve been telling him “enough” all the time! What a scary night, I am so glad he wasn’t bloating and is on the mend. It was a scary and long night! Wow, scary times…glad Leroy is okay and thanks for the info…memory banked this as it’s one of the things I worry about too given I have a “Marley” type Lab. Gosh, glad he was okay! My sis and I were just talking about bloat on Tuesday cuz one of her neighbors lost their dog to it over the weekend. So awful! I didn’t really know these signs, so thanks for the info. Oh no Jackie! I’m so sorry to hear about your sister’s neighbors dog! Uggh, that makes my heart sink! My girls refuse to eat 2 meals a day. We have a few good treats at lunch and then they have to wait until dinner. If they eat anything in between they won’t eat. They don’t do much before eating since they are waiting for day an hour. I really hope Leroy starts feeling much better I worry about him. That is awesome that you taught them to burp! I wonder if I could teach my guys that?! I’ve been worrying about Leroy too, he’s just not himself 🙁 but I’m hoping he’s on the mend now. Thanks Cathy and I’m glad that this post shared some things you weren’t aware of! Hopefully you’ll never need to use any of them! I’m so sorry you had to go through that! I am extremely grateful that my boys aren’t prone to bloat and have never had to experience what you did. Glad to hear that Leroy is OK. Hopefully he’ll be back to himself very soon, if he’s not already. That’s excellent you know Sherman and Leroy so well. It really helps in situations like this. I used to have a sick kitteh, so I got to know his body pretty well too. Thank you! It is so important to know your dogs and cats! We don’t have breeds that are prone to bloat, but our puppies eat super fast and it was a huge concern, so I changed their bowls to slow them down. It took a bit for me to find bowls that would work with raw, but I did. Thanks! Sherman use to eat really fast too and it took some time but we were able to get him too slow down thankfully! Whew. Good thing it wasn’t bloat! Gretel got a distended stomach twice and it ended up that she had gotten into some food and absolutely gorged herself and we didn’t know it. That happened to our Beagle a few times too! He got into the dog food and ate until he started vomiting! I’m glad Gretel was ok! That is a scary stuff! Yes, our guys are one of the breeds at risk. I hope that fate can safe me this type of scare, though. It’s always in the back of mind and I hope it never actually happens, for any dog! Poor Leroy! I’m so glad he is doing better Jen. We had a scare this past summer with Bea. Some of the same symptoms and off we went to emergency Vet services (a Sunday of course). She was filled with gas and they gave her something to get rid of it so we lucked out. We have always fed our Newfies three times a day. They basically eat when we eat. They always have their big jug water dish so excessive drinking afterwards has not been a problem. They did like to go outside after dinner and run around but since they are both older now, that has diminished. Bea has bone cancer (diagnosed in January). We switched to Raw feeding (cancer likes carbs) and this has helped out tremendously with their overall health issues including tummy troubles. It ain’t cheap but she is still here with us so we hope it is buying her some time. Vicki-I had no idea that Bea was diagnosed with bone cancer. I’m so sorry, but I’m glad to hear that she is doing well! Thanks for the feedback on the raw, I’ve been thinking about that for quite some time…. Whew – so glad Leroy was okay! Bloat scares the crap out of me and I was sure Lola was experiencing it on a number of sleepless nights… but alas, she was not… and as you said, there are some very key signs. I always worry about it though… So scary. Glad it wasn’t bloat, thanks for sharing your story. Hope he feels better now! !